You most likely will NOT have time to discuss every print in this packet, so definitely use the largest print, Grand Canyon, and choose three or four additional small prints to discuss with it. Focus on comparing the smaller prints to the larger print. Lawrence Ormsby, whose work is mostly in illustration, has created his painting in a very different STYLE than the other artists. Grand Canyon was created with ink and watercolor. Inked LINES outline the SHAPES of animals, birds, trees, plants and the walls of the desert canyon, found in the distance. The COLOR of this painting is much lighter than the coloring found in the smaller prints. This is partly because of the setting. The settings of the smaller prints are wetland, woodland or forests in areas of Oregon. These settings have much more COLOR than the Grand Canyon desert area. Grand Canyon is the only print in this packet that has a desert setting. Another difference in COLOR is the medium the artists chose to use. This is the only watercolor found in the packet and this medium allows the inked details of the plants and animals to show through the paint. The other pictures were created with oil paint, which is thicker and heavier. 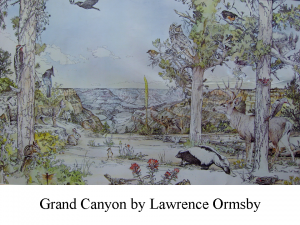 Ormsby created TEXTURE on the birds and animals, the canyon walls, and tree bark with LINE. Point out the TEXTURE on the tree trunks. If this picture had no COLOR at all, we could still see TEXTURE. The oil paintings depend on COLOR to create TEXTURE. Compare the realism of the two STYLES of texture. The rich color of the oil paintings can create a much more realistic and photographic version of TEXTURE. COLOR can also be used to create MOOD. Compare the MOODS of several of the paintings. Red Fox depicts cold, misty morning stillness, interrupted by the quiet stealth of a fox, moving across the FOREGROUND. Gray Wolves has a more menacing and cold darkness. Ruffled Grouse has a crispy autumn MOOD. Because so many of these artists are from Oregon, it would be interesting and informative to locate where they are from on a map with the class. Be sure ALL 7 pictures are returned to the packet carrier. Sculpt an animal from clay. A good chance to use LINE to create details and TEXTURE (Especially for grades 3 and 4). Give everyone a toothpick to create realistic fur on their wolf or squirrel by etching the surface with LINE. Feathers can be shaped on bird sculptures with overlapping PATTERN LINES. Some kids will have a hard time deciding which animal to sculpt. It might help if you narrow their choices by assigning two or three specific choices, or a single choice that you would demonstrate, a step at time in the front of the class, as they follow along. If you choose to demonstrate, only show the steps to create the basic FORM of the creature. Keep it simple so the class will not be intimidated by your example. Some students may ask, or even beg you to do this step for them. Be firm that you will only demonstrate the steps so they can do it for themselves. Insist that they also do the details on their own. Watch as they sculpt and make suggestions when they need help. DO NOT TOUCH the student’s sculpture. It is important that everyone sculpt their own animal. Point out different STYLES of sculpture as you move around the room, especially if you notice a more primitive looking animal. Clay sculpture takes practice and the ones that are very good at it most likely have had more chances to practice. Point out how pleased you are that so many have chosen to create their own STYLE with their sculpture. Praise uniqueness and creativity. It is destructive for kids to compare their work with others. If you catch them doing this, find a positive difference to praise in each. Emphasize that differences are the result of an artist’s particular STYLE. 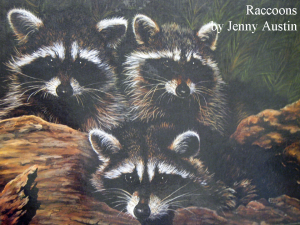 Older classes can paint a Raccoon face with tempera paint. Point out the basic SHAPES found in the different areas of the face. Make a simple and light pencil outline of the face SHAPE on a dark blue or green background. Use black to paint the basic face. Mix white and black to create a light Shade of gray (remember to start with white and slowly add black). Use thin strokes of this to highlight the fur along the outside edges of the ears, the black mask, and the nose (a toothpick might work better for this fine line work). Leave some pure Black and White on the pallet, to use in the rest of the painting. Use thin strokes of brown and brown tinted with white, to highlight the strands of fur on the top of the head and the neck. 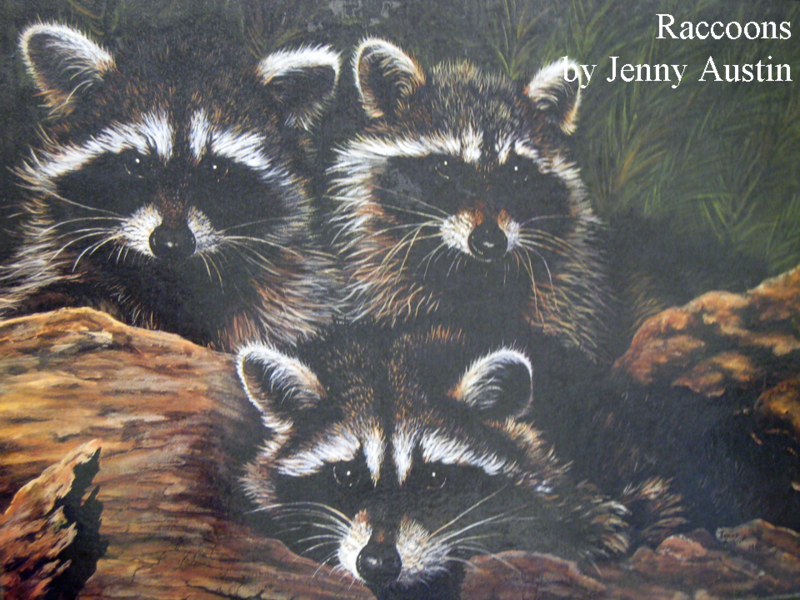 Maybe paint a log, if there’s enough time, like Jenny Austin did in her Raccoon painting. 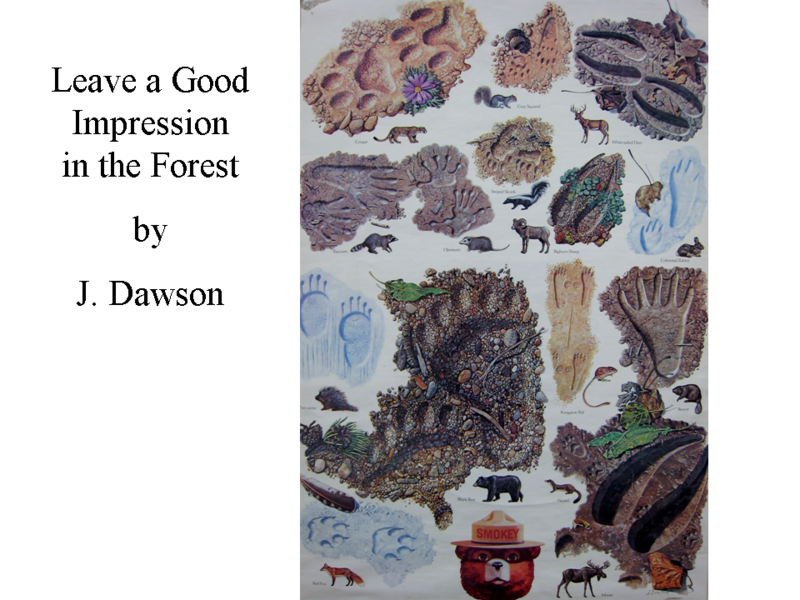 Copy the SHAPE of one of the animal tracks from the poster Leave a Good Impression in the Forest, onto a piece of scrap paper. Cut out the track shape(s) and trace around, using a ballpoint pen, onto a small (2” or 3”) square of thin craft foam. You can find this foam with a sticky back that has a peel off paper backing. (The sticky back is the best kind to use for this project.) Mount the animal track on a small (3”or so) square of wood, to create an animal track rubber stamp. Paint a wilderness LANDSCAPE. While it is drying, tear or cut construction paper SHAPES to create a wild animal. After the background dries, glue the animal somewhere in the landscape. Another variation would be to draw an animal, color it, then cut it out to glue in the painted landscape. 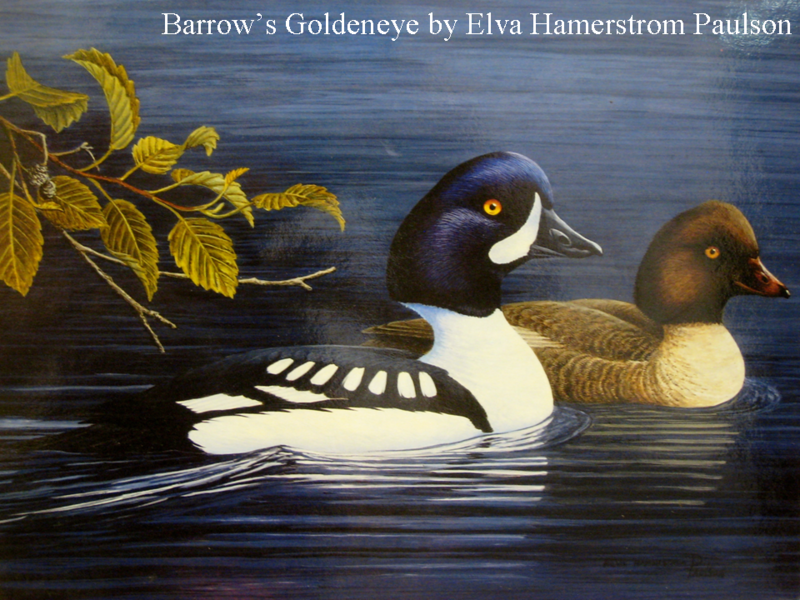 Cut out colored shapes (head, beak, body) to create a Hooded Merganser, Barrow’s Goldeneye or a Mallard Duck. Glue these colored shapes to a painted water background. Draw a wildlife landscape scene with an animal or several animals lightly with pencil. Use line to create texture in your picture. Trace over the pencil lines with a fine tipped, permanent black pen after the drawing is finished. Add color by painting with thin watercolor paint, to resemble the illustration style of Grand Canyon. Pass out the page of animal drawings for helpful ideas of animals to draw in the scene. Lawrence Ormsby is an artist and a photographer. He specializes in wilderness Landscape photography and wildlife book and poster illustrations. 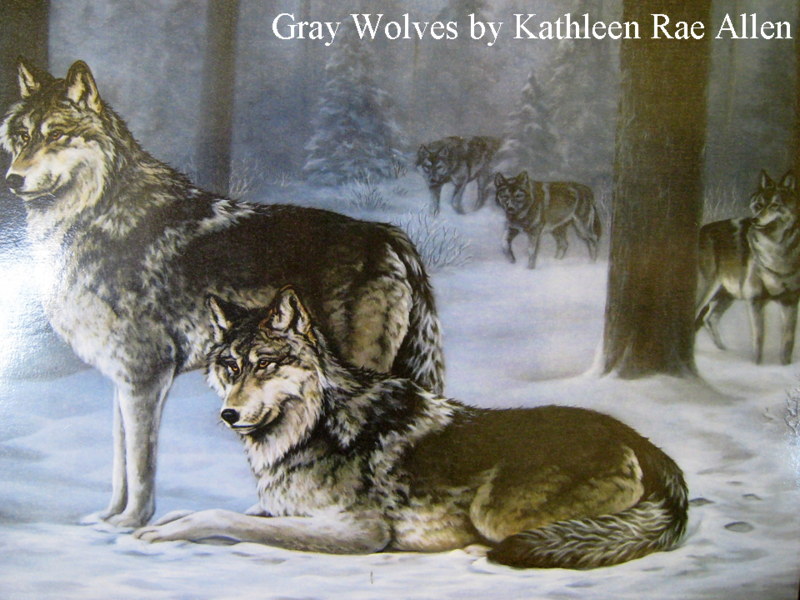 Examples of his many illustrations can be found in books including: Wolf Song and Raven Song, by Catherine Feher-Elston, The Smoky Mountain Black Bear by Jeff Rennicke, Ocean Animals in Danger by Gary Turbak, and Natural World of Jackson Hole by Tim W. Clark. This ink and watercolor painting has a light and airy feeling, compared to the darker and more intense COLOR of the oil paintings found in this packet. The animals in this picture are standing at the top of an area of canyon, which leads off into the distant Grand Canyon, found in the far BACKGROUND. Point out the way the opening between the trees is wider in the FOREGROUND of the picture and narrows as our eyes move higher up in the painting. If we were to draw an imaginary LINE, beginning in the right FOREGROUND of the picture, along the ground at the base of the trees, the LINE would stop at a VANISHING POINT on the HORIZON LINE of the far canyon wall. Beginning on the other side of the picture, at the left FOREGROUND, our eyes follow another imaginary PERSPECTIVE LINE, moving at the same angle, toward the same VANISHING POINT on the horizon. This is called ONE-POINT PERSPECTIVE. This camouflaged triangle arrangement draws our eyes into the picture and creates the illusion of three-dimensional SPACE on a two-dimensional surface (the painting). Notice that the animals are fairly evenly spaced around the picture. Each animal has its own space in the print, in their own natural setting—the lizard is sunning itself, the birds and the squirrel are in the trees. The animals in this picture live in the Grand Canyon area of Arizona. How many birds can you find in the trees? There are 8 but you need to look closely to see them. There are two additional birds in the picture—the tufted bird standing on the ground and the crow in flight. Point out the opening between the trees. It is wider in the FOREGROUND of the picture and narrows as our eyes move higher up in the painting. If we were to draw an imaginary LINE, beginning in the right FOREGROUND of the picture, along the ground at the base of the trees, the LINE would stop at a VANISHING POINT on the HORIZON LINE of the far canyon wall. Beginning on the other side of the picture, at the left FOREGROUND, our eyes follow another imaginary PERSPECTIVE LINE, moving at the same angle, toward the same VANISHING POINT on the horizon. This is called ONE-POINT PERSPECTIVE. This camouflaged triangle arrangement draws our eyes into the picture and creates the illusion of three-dimensional SPACE on a two-dimensional surface (the painting). Kathleen works in oils and is primarily self-taught. She is noted for her REALISM. Wisconsin born, Kathleen became an Oregonian at age three, when her family settled in the McKenzie River area of the State. She painted in her teens, tried the business world in her twenties and returned to art at age 29. Kathleen holds shows regularly in Eugene area Art Galleries and throughout the United States. While there may not be any true wild wolves left in Oregon, occasional unconfirmed sightings keep the thought alive. Restocking efforts are met with resistance in other states because of the potential conflicts with man and livestock. Probably more than any other animal, the wolf typifies the wilderness wildlife of early Oregon. What do you notice first in this picture? The wolves in the FOREGROUND. Wolves travel in packs. Each pack has what is called the Alpha-male and Alpha-female. These two wolves are the leaders of the pack. The rest of the pack will not even look these leaders in the eyes because the other wolves are submissive to the wolf in charge. What MOOD is created in this picture? It seems cold and still. The artist shades the scene, (trees and snow) with blue, which creates a darkening, misty stillness of twilight. There is a feeling of anticipation as the other wolves of the pack, seen in the background, wait for a cue to follow. Elva lives in Roseburg, Oregon and her paintings are in galleries in Roseburg, Eugene, Klamath Falls, Ashland and Sisters, Oregon. Elva’s aim in her painting is to capture the details of the animals that bring it to life, the saucy boldness of a red squirrel or the iridescent sheen on the drake (male) Goldeneye. A cavity nester, the Goldeneye prefers the open rivers to ponds. Its young may jump from the nest at two days, which may be as high as 60 feet from the water. 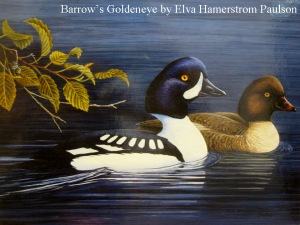 Similar to the common Goldeneye, Barrow’s Goldeneye is blacker and has a white crest in front of the eye, with a purplish head. Which one is the male? In the animal world the male is often the more colorful one! Jenny Austin creates artworks using various MEDIUMS—oil paint, acrylic paint, pen & ink, watercolor and pastels. This painting was created with oil paint. Jenny is a self-taught artist, or a folk-artist artist. Jenny never attended art school or college art classes for formal art instruction. One of the most distinct of Oregon’s furbearers, the black mask markings have given the raccoon the nickname of “masked prowler of the night”. Usually nocturnal, the raccoon’s nightly raids on chicken houses, pet food dishes, and corn patches, combined with its lack of fear for civilization, make this animal well known in many areas, including cities. The Eastern Oregon subspecies of the Raccoon is the largest variety found in the U.S.
What type of BALANCE does this picture have? ASYMMETRICAL BALANCE The subjects (raccoons) are on the left of the picture. If you divided this picture in half, both sides are NOT exactly the same. Why do you think the artist did this? Raccoons are nocturnal, which means they like to wander and scavenge at night. Katherine lives in Blachly, Oregon. Her work is displayed in Winchester bay, Eugene, and in Jackson Hole, Wyoming. Katherine strives to produce excellence and accuracy in her work while making art that people can feel they are a part of, what they are out seeing the wildlife. 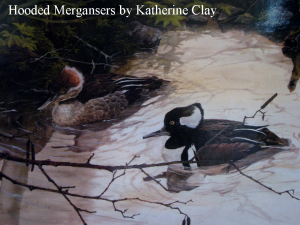 Mergansers often return to the same nesting site each year (migratory). They are good divers and feed on the bottom, as well as on the surface, of the water. Where does your eye travel as you look at this picture? What time of day is it in this picture? Royce Kugler is best known for her depiction of wildlife from the northwest. She works in oil paints. Royce moved to Oregon in 1975 and regularly paints and shows in the Portland area. She hopes that through her art people will see the fragile balance of nature. The Chickaree Squirrel, or Pine squirrel, goes by these two names as well as either the Douglas Squirrel or the Red Squirrel. The Douglas Squirrel is found in Western Oregon. His undersides are yellowish to orange. The Red Squirrel lives in Eastern Oregon and his undersides are grayish white. 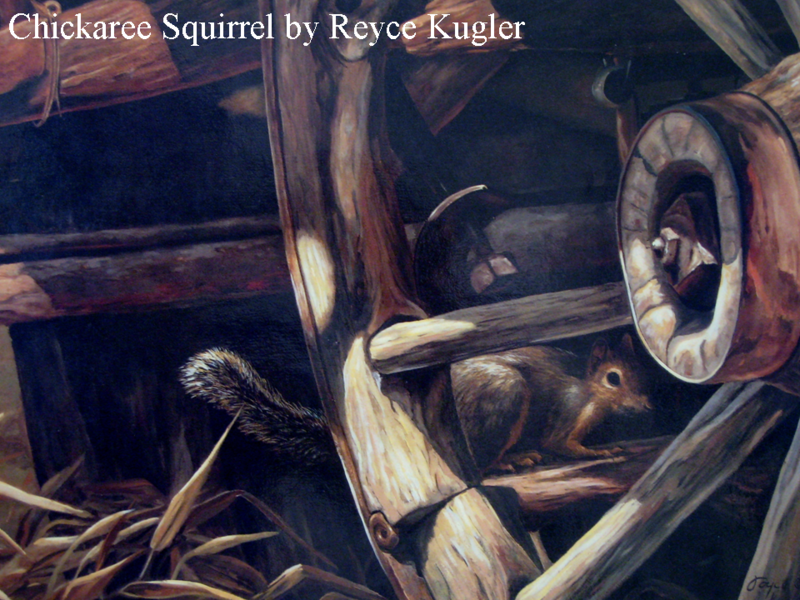 Point out the way the squirrel is framed by the wagon spokes. Notice how all of the LINES in the picture draw our attention towards him. Can you find the squirrel’s tail? Royce did not paint this squirrel on a branch of a tree where he would look dominant and be easy to see. She hid him under a wooden wagon, behind a wheel, like he had just stopped for a minute. The squirrel’s color even works like a camouflage. We have to look closely at the picture in order to find him. 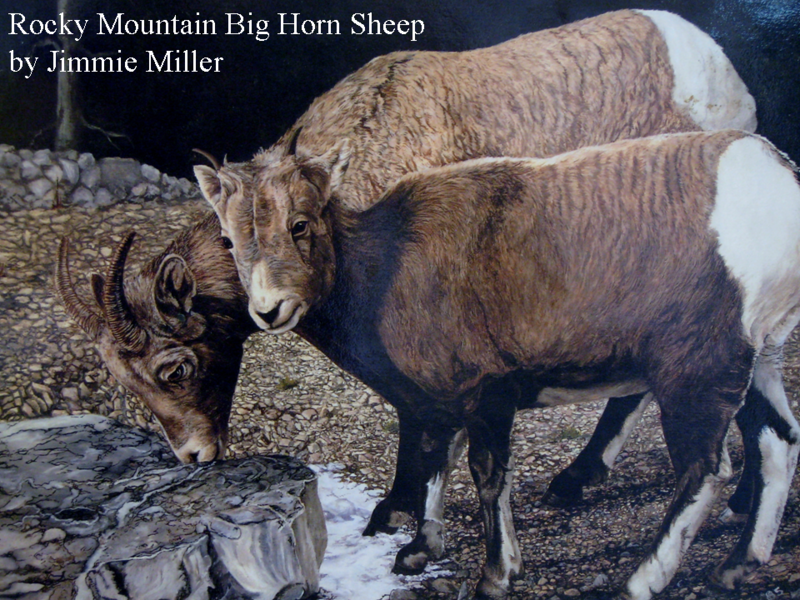 Jimmie Miller has been painting many years with wildlife at the top of her list of favorite subjects. Her favorite medium is oil paint. Jimmie moved to Oregon from Texas, in 1953, and calls La Pine her home, where there are abundant wildlife subjects to be studied and painted. Rocky Mountain Bighorn Sheep disappeared from Oregon by 1945 and joined the California bighorn Sheep on Oregon’s extinction list. A transplanted population of 20 Jasper Park Alberta Canada sheep were successfully reintroduced to Oregon in 1971. These sheep, and other transplants have resulted in the reestablishment of four populations of Northeastern Oregon sheep. In 1986, the estimated total of Bighorn sheep in Oregon was 290. This artist did a good job of focusing on the TEXTURE of things. Notice the almost photographic detail of the painted fleece of the sheep, the striations on the ram’s horns and the pebbles on the ground. Kip Richmond creates his art with an uncanny skill for detail. His work combines his professional training as a graphic artist and his eye for detail, to paint very realistic works. 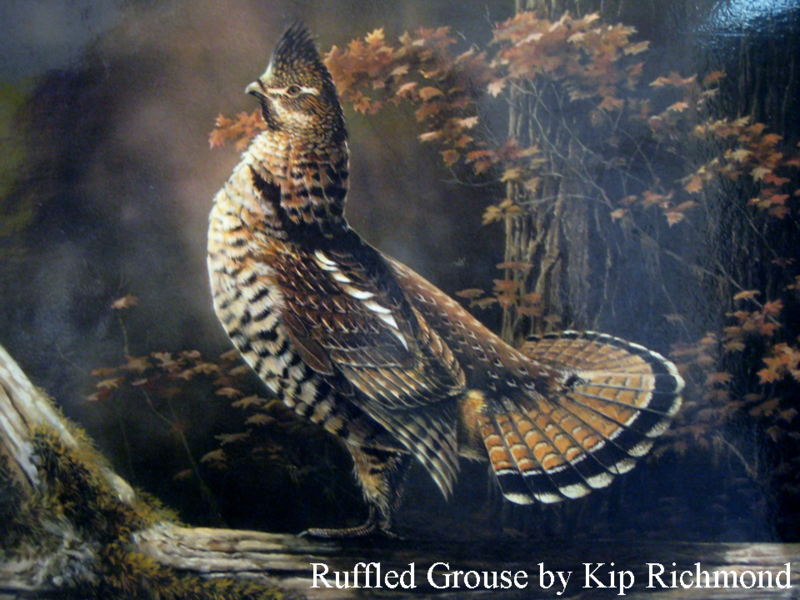 This grouse painting was the runner-up for the Oregon First of State Upland Stamp competition. The Ruffled Grouse is probably Oregon’s most widely distributed upland bird. The gray Ruffled Grouse is found in the eastern part of the state and a more brownish-colored bird is found in the west. This type of bird makes a drumming sound by beating their wings together. Point out the way the artist has painted the detail in the Grouse’s feathers. These are so striking that the painting looks almost as real as a photograph. The most notable detail of this painting is the highlight which strikes the bird’s chest. The highlight is created with the use of light/dark contrast. When Judy was four, her family moved to Oregon and lived on a ranch at the base of Mt. Emily. Here, Judy trained her own horses and performed trick roping at horse shows and rodeos. She later moved east and raised two sons on an isolated ranch that had no electricity or running water. 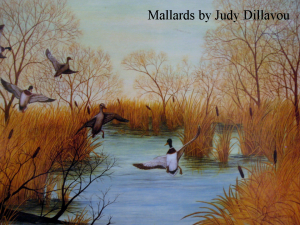 It was here, during long, six month winters, that Judy, with no formal training, started to paint and develop her own style. Over more than 20 years, Judy has shown and sold hundreds of paintings. Her paintings have earned many ribbons and awards in Idaho, Washington, and Oregon. When Judy moved to Corvallis, she joined the Corvallis Art Guild and has also served as President of the Guild. Mallards are Oregon’s most common and well-known pond duck. They are found throughout the state and both nest and winter here. They have a glossy bluish-black curled up feather in the top tail that is different from other ducks, as well as the male’s dark green head and white collar. This picture is not a close-up of the ducks, the way some of the other prints are. Instead, it is a full scene that includes the flying behavior of the ducks when landing in water. Can you see how the artist has lined the ducks up in diagonal LINES. If you connected the lower duck with an imaginary line to the two ducks diagonally above him, it would be a pretty straight diagonal line. The two ducks on the farther left are also arranged in a diagonal line. Can you find a triangle in the picture? The three center ducks form a triangle if you connected them with a line. Besides the ducks, what else can you see in this picture? The trees and the yellow/gold grasses look like it is autumn. There is a fallen tree in the left foreground and cattail heads are scattered around the shoreline. The father Mallard duck has a glossy, bluish-black, curled up feather in the top tail that is different from other ducks, as well as his dark green head and white collar. The female Mallard is very plain compared to the male. She is shades of brown, with white highlights, so that she blends into the grass as she sits on her nest with her little ones. Can you see the duck’s reflection in the water? Color or paint the reflection a darker shade than the rest of the water. Try to draw your own mallard duck using this example. The easiest way to do this is to first draw the main oval shape of the body. Next, draw the round shape of the head and connect it to the body with two parallel curved lines. Add the rounded triangle shape of the beak and the tail shape. Add feathered details, wings and eyes. Lois was raised in Northern Minnesota and lived in Eastern Oregon. She has found joy in observing and painting wildlife. 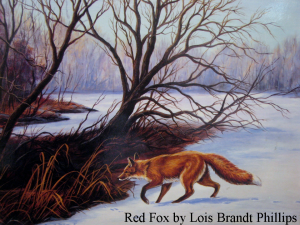 Lois is a mother of six and an author/illustrator of two books; “Wildlife Woodcraft” and “Decorative Painting Using Nature’s Pattern”. She now lives in Klamath Falls, Oregon. Found mainly in the Willamette and Rogue Valleys, the Red fox is the result of transplants from the Eastern United States. Native stocks apparently died out or were hunted out. Occasionally seen in Eastern Oregon, the fox has a wide variety of color phases from red to silver gray to black, but still retains the white tip on its tail. Can you find any diagonal LINES in this picture? There are diagonal LINES found in the tree trunks and the tree branches in the middle of the picture. The fox’s tail is a diagonal LINE, and so are each of his legs and the profile of his head to his nose. The rabbit tracks the fox is tracking follow a diagonal line. The grass and undergrowth have diagonal lines above the white snow and form a diagonal triangle from the left foreground towards the center of the picture. Where do you see CONTRAST in the picture? The fox stands out (contrasts) against the white snow. The tree in the center and the grassy undergrowth also contrast the white show. Can you see how the artist used repeated LINE to create the furry texture of this animal? Draw the shape of a wild animal (bear, wolf, coyote, or squirrel) and create the texture of its fur using repeated LINE. Add color when the drawing is finished.